Kukko Schwarz 4,5 % alc. 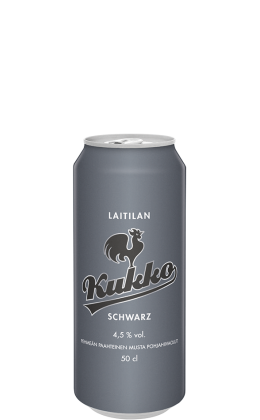 Laitila's Kukko Schwarz is a nearly opaque, subtly roasty bottom-fermented beer, whose full-bodied flavour is formed by unfermented sugars. The sweetness is balanced by the chocolatey and roasty notes of dark malts and a finely tuned hoppiness. 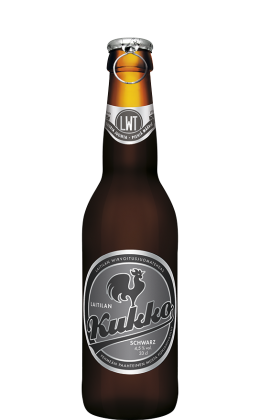 This combined with a moderate alcohol content make Laitila's Kukko Schwarz a world-class taste experience. The full-bodied Laitila's Kukko Schwarz goes perfectly with, for example, chocolatey desserts. Naturally, this beer is the drink of choice for warming up social occasions on darkening autumn evenings. Thanks to its refined hoppiness, Laitila's Kukko Schwarz is an excellent cooking ingredient, such as in marinades and sauces. Recommended serving temperature: +8 to +12 °C. Water, malted BARLEY (Münich Light, Caramel 300, Black), hops (Magnum, Hersbrücker).